This easy Taco Casserole recipe is a breeze to make and is full of those Tex-Mex flavors your family loves. Serve with your favorite toppings for a quick dinner! 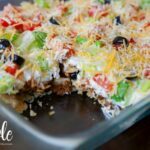 Such an easy taco casserole recipe that takes minimal prep work, and just a little time baking in the oven for a quick and delicious dinner that will become a family favorite. 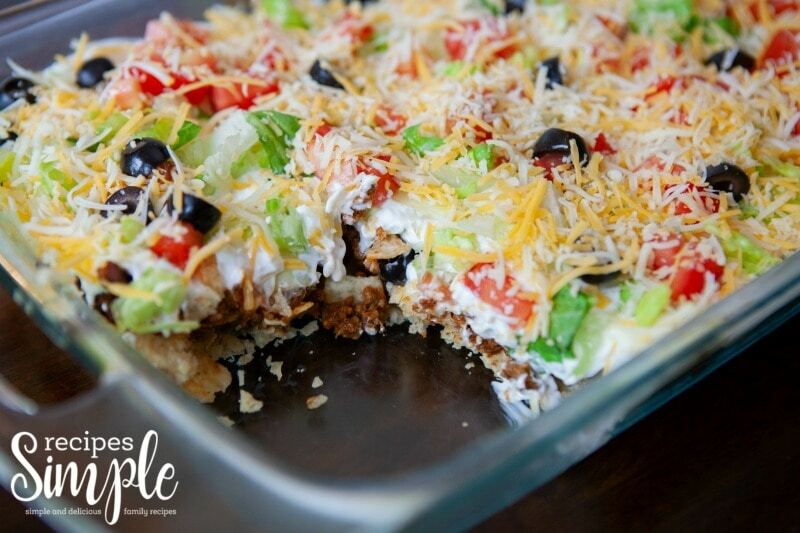 This Taco Casserole Is Perfect For Busy Weeknights! 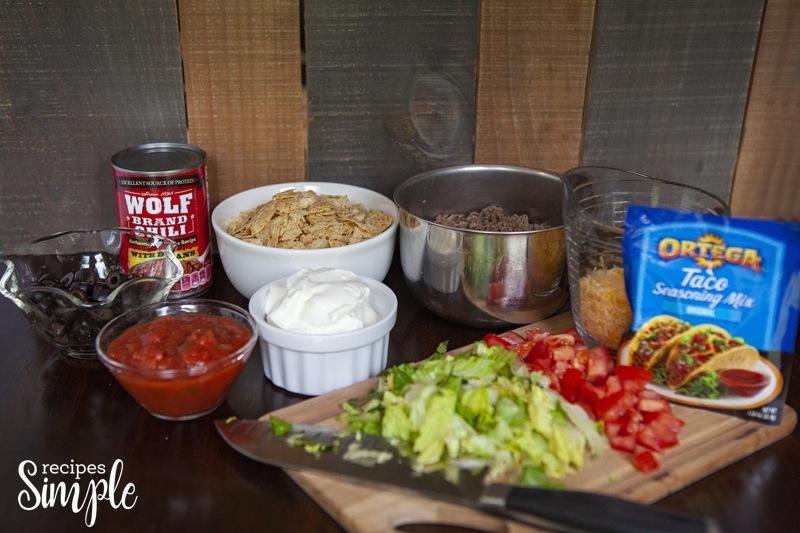 Sometimes I use this recipe for our Taco Tuesday night! It gives us the flavors we love with a little change from a classic hard shell taco. Even our picky eaters like it. 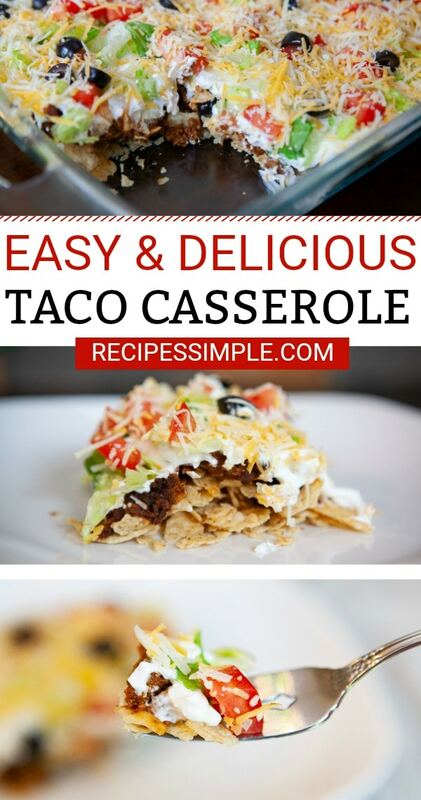 Scroll to the bottom for printable Taco Casserole recipe. Mexican food is my favorite and whenever we eat out it’s my top pick. But it gets expensive eating out so I like to have some recipes that I can make at home so I don’t feel like I’m missing out. This is one of the recipes that I like to make when I am looking for something quick and easy. It’s perfect for busy weeknights when you don’t have a lot of time to spend in the kitchen. It tastes great and everyone likes it. That’s a win for me! 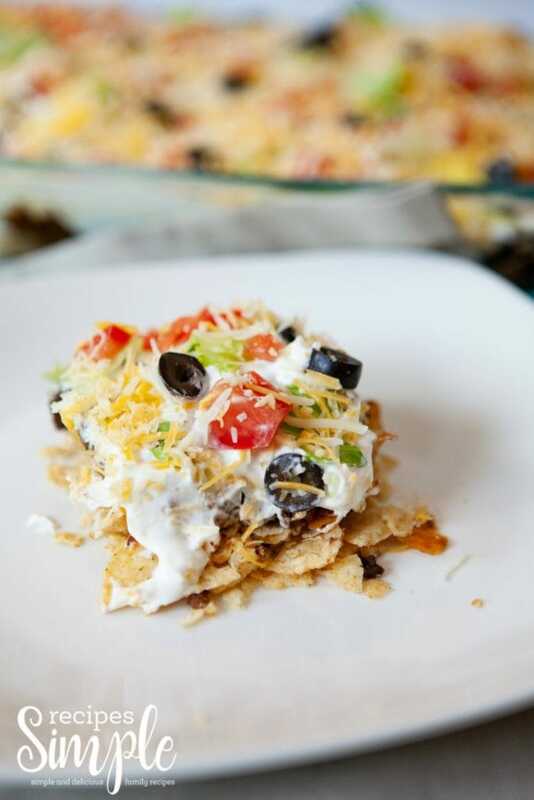 Start by taking your casserole dish and sprinkling crushed tortilla chips on the bottom to create a layer. 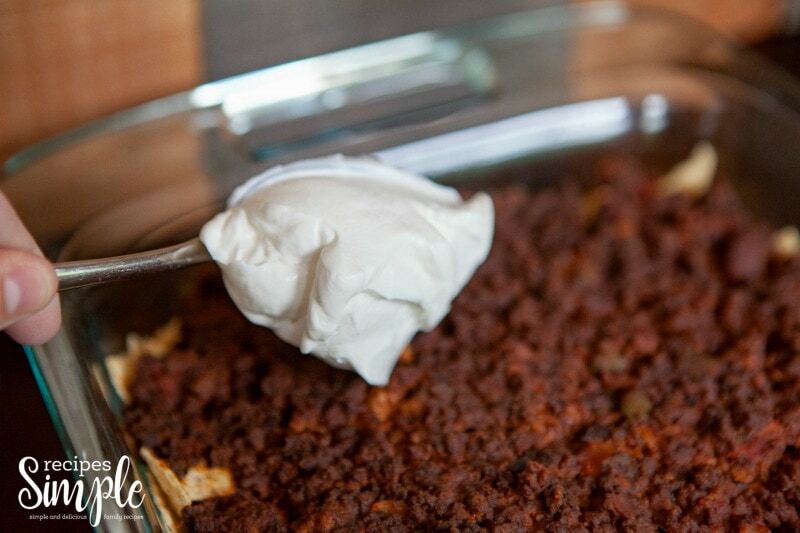 Next, in a pan cook your ground beef, and drain out the fat. 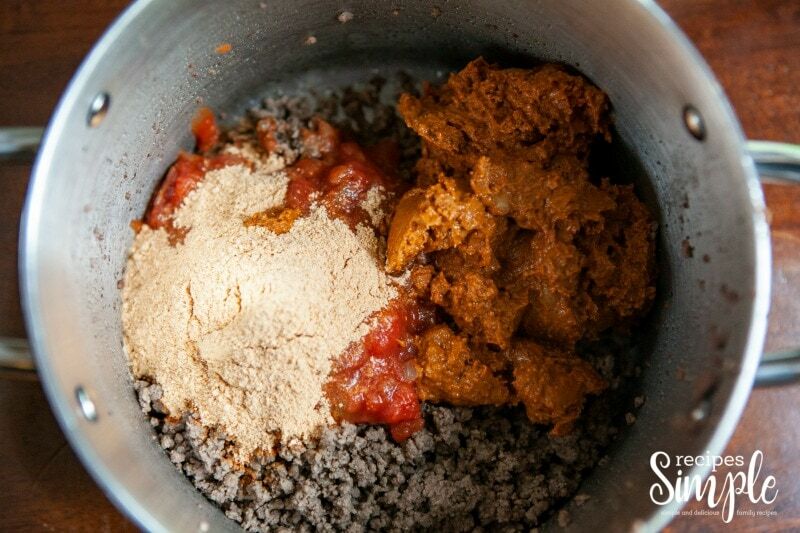 Add your taco seasoning, salsa, and chili beans, and mix well. Let it cook for just a minute. Pour this over your tortilla chips, and bake for 15 to 20 minutes. Pull it out and top with lettuce, tomatoes, cheese, olives, and sour cream! I like to serve this with some homemade guacamole and tortilla chips. You could also add jalapenos, chopped onions, green peppers, and avocado slices. This taco casserole is a breeze to make and is full of those Tex-Mex flavors your family loves. 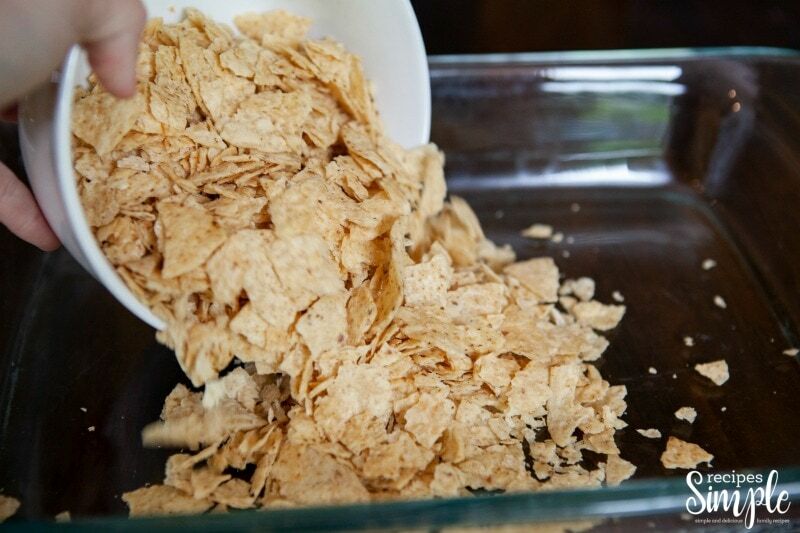 Spread crushed tortilla chips in the bottom of a 9x13 baking dish. 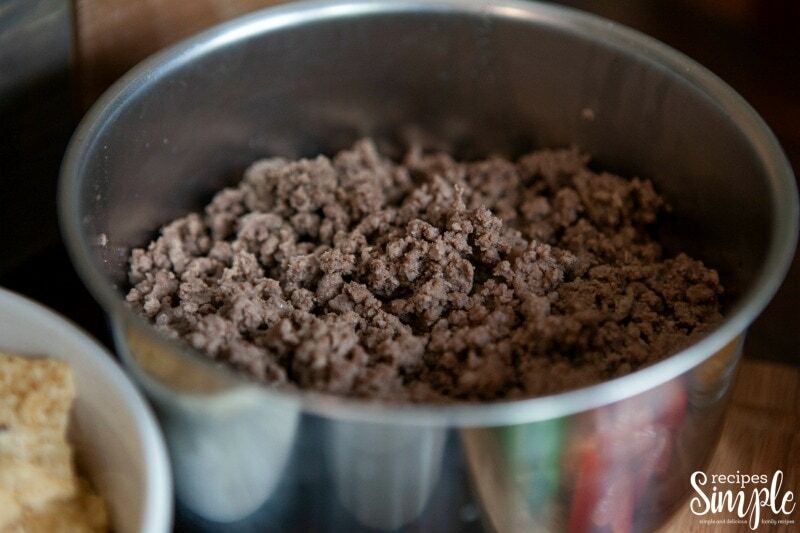 Brown ground beef and drain the fat off. Add taco seasoning then mix the salsa and chili beans in with the ground beef. Spread over tortilla chips. Bake for 15-20 minutes. 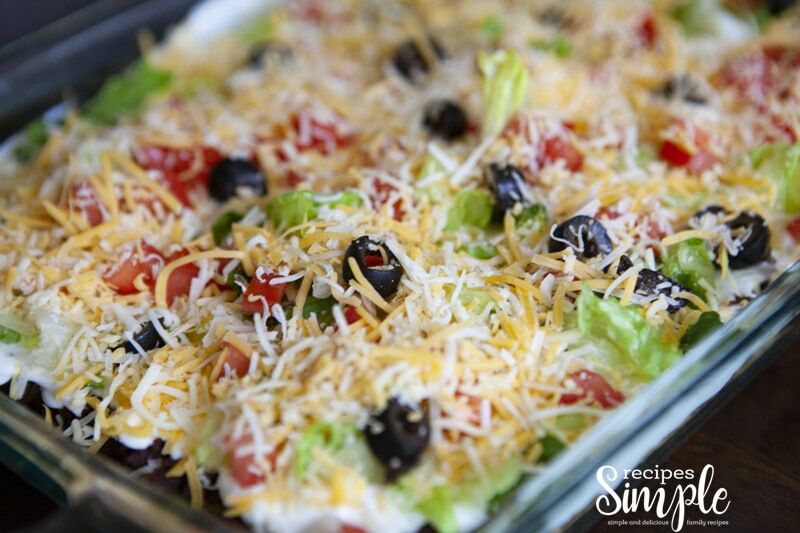 Top with sour cream, lettuce, tomatoes, cheese and olives. Serve immediately. 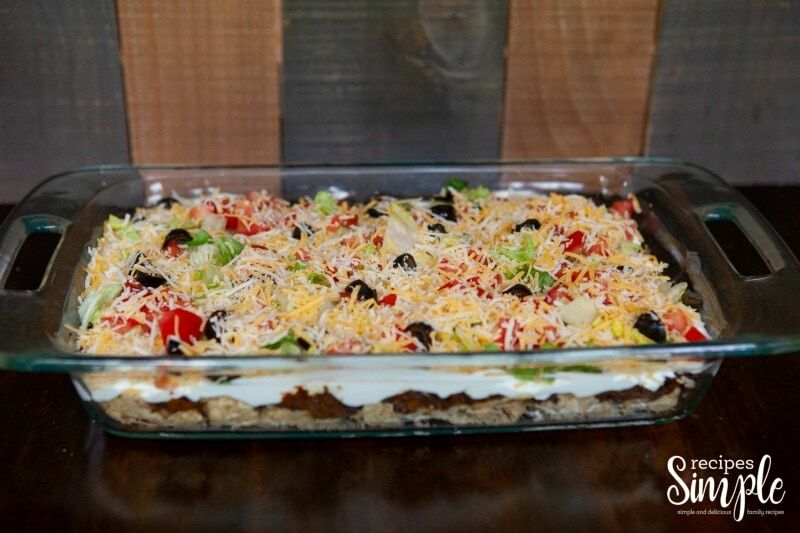 Hope you enjoy this Easy Taco Casserole! Do you think this would work with soft corn tortillas? I’ve never used soft corn tortillas but I think they would work also. Loved it! So simple too! I’m glad you enjoyed it. It’s a favorite at our house! How many servings does Easy Taco Casserole make? It makes 6 to 8 servings depending on serving size. Hope you enjoy it! What size can chili with beans? It’s a 15 ounce can of chili with beans. Hope you enjoy it!